Mashael Petroleum has an extensive network of counterparts spanning the globe in order to provide the best services and products to our clients. We also continually seek out new value-added collaborations to enhance our services. For example, we work closely with one of the biggest shipping and logistics company in the Middle East so that our products can be delivered in the most economical and timely manner. We also engage first class financial institutions to provide the necessary financial support for any transaction that we undertake. 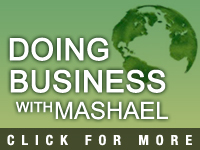 Rest assured, when you deal with Mashael Petroleum, you are also dealing with the best in the business.